Bonjour, Cet article peut vous intéresser : https://www.fondation-raja-marcovici.com/en/projet/health-cafe-prevention-and-access-to-sexual-and-reproductive-health-care-for-people-in-situations-of-great-precariousness-and-vulnerability.html. 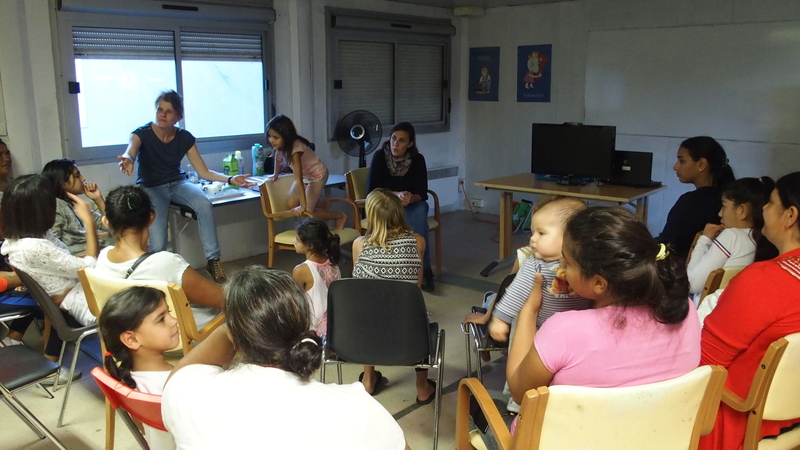 Following a worrying observation about the very precarious living conditions of the Roma people, the city of Grenoble set up in 2015 an emergency shelter in the Rondeau district. In order to respond more specifically to the needs of women, deprived before problems of domestic violence and poorly informed on sexual and reproductive health (SRH), the French Movement of Family Planning of Isère (MFPF 38) launched in 2015, in partnership with Roms Action, the Health Café project. These monthly collective workshops are designed to inform and raise awareness among women on SRH issues, and to strengthen their autonomy and access to care. In the context of increasing attendance and interest in workshops, MFPF 38 wishes to increase the frequency of workshops, develop preventive measures for girls and train social workers on the reception and management of this audience. In this way, women and girls will become aware of their rights and the consequences of their life choices (early pregnancies, deschooling, etc.) on their autonomy. Le mouvement Français du Planning Familial (French Movement for family planning) fights against social inequality and oppressions and act for changing mentalities and behaviours.